Here's How To Sell Used Car Parts and Preowned Vehicles for top dollar: List them on ebay. The monetary value of your used car (in fact, the monetary value of anything) is whatever is the highest price someone is willing to pay for it. The largest online retailer is ebay, and ebay has a gigantic automotive inventory. Simply follow these 10 quick and easy steps to get started. 1. Clean the vehicle. Give the car a thorough wash, inside and out. 2. Photograph the vehicle. Be sure to include the interiors, and views of the car from all angles. 3. Upload the photos onto your computer. 4. Sign in or sign up at ebay. This service is free. 5. Click the link that says "sell." 6. Click "Sell it Myself"
7. Type "used car" in the search bar. 8. Let the prompts lead you along. If possible, select an existing template similar to the item you are selling. 9. Price your item by scanning "Completed Listings" of similar items. Sold items are highlighted in green. This will give you some idea of how much money you can expect to get for your used car. 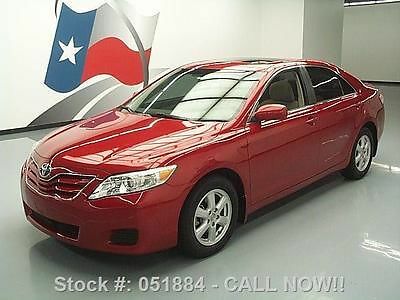 For example, a well maintained 2010 Toyota Camry like the one shown above sells for anywhere from $12,000 to $15,000 on ebay. 10. Upload photo images to your ad, and write a brief description of your item. Be sure to mention ALL known defects. Here's how to sell automotive merchandise offline. Try any or all of these ideas. * Place an ad in your local newspaper. * Place a clearly visible sign on the inside of each back seat window. Be sure to include the asking price and your phone number. * Park your vehicle for sale in a highly visible location. * Post flyers on local bulletin boards and store windows. * Sell your car directly to a used car dealership. A dealership is How To Sell Used Car the easy way, but your profit will be less, because the dealership also needs to make a profit.